Esports Now Involve Wagers on Events, Much Like Sports Betting. Full Tilt Poker is searching for new online poker players in the eSports community. Full Tilt is not only advertising on Steam Greenlight, but their poker client now interfaces with the online gaming community. Esports is the catchy new name for online computer gaming. 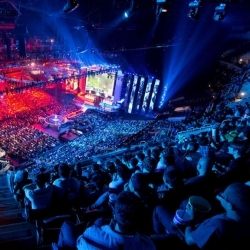 Esports competitions have a big enough online audience that professional gamers exist. Even more astounding, gamblers can bet on the outcome of eSports contests. Full Tilt Poker, recently approved for a gaming license in New Jersey, is betting it can convince some of those online gaming enthusiasts to try poker. Thus, the online poker site recently launched a 31-second ad on the Steam Greenlight network. The video shows Jackpot Sit n’ Go tournaments and FT’s Rush Poker, and the advertisement has received good reviews for production value. Full Tilt’s poker client is now featured on Steam Greenlight. That does not mean Full Tilt can be played yet on Steam’s popular gaming community, which is owned by the Valve Corporation. Instead, Full Tilt Poker has been presented to the Steam Greenlight community for approval. The presentation involves screenshots and preview videos. Members then vote on whether they think the game should be “Greenlit”. If so, the Valve determines whether the game fits their eSports community or not. At the end of that process, if FTP is greenlit by getting enough votes, then the poker client could become available to 125 million users. That’s how many members there are in Steam’s online gaming community. Overall, the community has over 6,400 games available. Among those games include fan favorites like Half-Life, Counter-Strike, Dota 2, Left 4 Dead, Team Fortress 2, and Portal. The key to gaining acceptance from the players community is likely to require convincing them that Texas hold’em is a game of skill. Many millennials have turned away from brick-and-mortar casinos, because they don’t want to play games with no strategy or skill required to master it. If successful, the poker site could have access to a whole new type of game enthusiast. Full Tilt Poker believes many of those gamers are going to like poker, because it is a game of skill which can be mastered. This could be a good time for Full Tilt Poker to gain access to the Steam community. On November 10, Valve plans releases a whole new wave of Steam products in brick-and-mortar computer gaming shops in North America and Europe, including GameStop in the United States and Game in the United Kingdom. One of the products is a new Steam Machine console, which is going to offer Steam 2.0 OS, the latest operating system for Valve’s many games. Whether New Jersey eSports enthusiasts will be able to log-on to Full Tilt Poker for online card playing is still to be decided. When PokerStars and Full Tilt Poker were licensed for operation in the New Jersey gaming market last month, Amaya Gaming’s David Baazov said PokerStars would control all the poker playing in the market. Baazov added Full Tilt Poker might support the online casino side of the business, but he was non-committal. Esports is a grow hobby around the world. Online gaming has been popular for a long time in the United States and around the globe, but the viewing of online games as a spectator sport is a more recent phenomenon. In the past few years, viewership of online gaming has become popular with millennials who enjoy those games. They watch experts play games they enjoyed, but weren’t world class at, much like people in previous generations would watch sporting events they played as children. It’s natural enough to do so, when looked at from that perspective. Organizers of such events and the websites which streamed the gaming called the phenomenon “electronic sports” or eSports. Even more recently, gambling on eSports has become popular. Sites like Unikrn offers gambling on eSports tournaments, much like one would offer sports betting. The practice is illegal in the United States at present, but the Seattle-based Unikrn believes that will not always be the case.